Free Stamp Set & Sale-a-bration Goodies!! Next month’s kit will feature a FREE stamp set, don’t miss it! Did you also know that when you purchase the 3 month, 6 month or 1 year subscriptions you qualify for Sale-a-bration Rewards?!! I have the links below … just click on the one you are interested in and begin. If you have questions, please feel free to contact me by messenger or give me a call at 262-334-1009. Thank you. 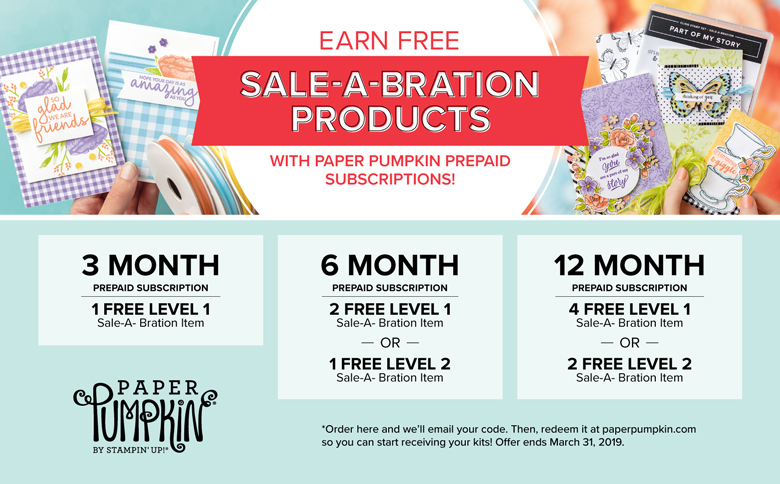 Paper Pumpkin = FREE Sale-a-bration items! !